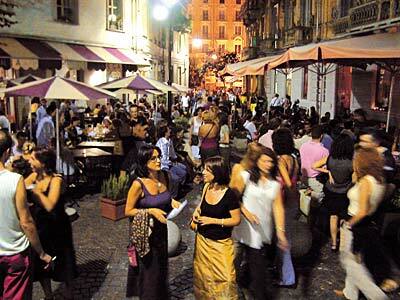 The Quadrilateral old town of Turin/Torino, just off Piazza Castello is the trendy, nightlife heart of Turin. Much like Soho or Notting Hill in London it has undergone a metamorphosis over the last few years and any tour of Turin's nightlife should include a visit to this area. On Friday and Saturday nights the area comes alive and its many restaurants and bars are packed full of locals enjoying a little "dolce vita". At the heart of it all is the Tre Galline restaurant, which dates back to 1575 and has seen it all. The restaurant is just as popular as ever and still sticking to its roots by offering excellent Piedmont fare. The prices are not the cheapest but the quality is invariably optimal although service can be a little patchy. On a busy night they sometimes seem a little overwhelmed. This is a good place to sample the bollito misto or the fritto misto, two of the hallmark dishes of Piedmont cuisine. However, let me warn you that the bollito misto is only for those who LOVE garlic. They don't always have bollito misto on the menu though - it is more of a winter thing. A good idea is to try their tasting menu. It consists of around six courses for 50 Euros and will give you a very good idea of what Turin's cuisine is all about. If you do go for the tasting menu then ask them to recommend a wine; actually do that no matter what you order. They really know exactly which wines go with which dish and my advice is to follow their recommendations. The dishes and wines have been similar here for centuries and they know the pairings better than many top wine experts. I visited with a top wine expert from Australia and he was amazed - said there was no way he could have chosen so well. Their wine collection is huge and one of the best of any restaurant in Turin. The collection of Piedmont wines is exhaustive, as is the collection of Italian wines from other Italian regions, with literally thousands of Italy’s best wines on offer. I have enjoyed many a dinner in this restaurant and can thoroughly recommend it. The proof of just how good it is can be confirmed by the fact that after well over 400 year it is still going strong. For more on amazing Turin click here. One last thing - please subscribe to my monthly newsletter for great restaurant tips and much more besides.